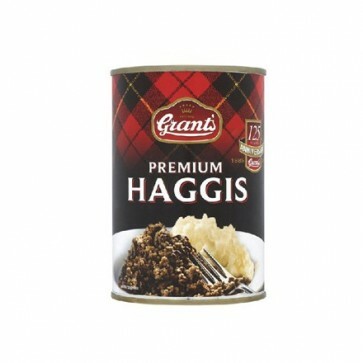 Deliciously rich Grant’s Premium tinned haggis made from the finest ingredients. Available for delivery within Europe and worldwide (excluding the USA Singapore Norway and Australia) Serves 2 approx. Ingredients: lamb lobes(45%) oatmeal (19%) Scottish water suet onion salt spices. Contains gluten. If substitutions are required we will ensure that they are to the same (or higher) value and compliment your original selection. If you have any special requests please do not hesitate to call us on 01360 440066. We can deliver to all countries in the EU plus Switzerland, USA, Canada, New Zealand & Australia. We regret that we currently can not accept orders for any other countries. International delivery prices depend on weight, volume and destination and will be calculated at the checkout. Express and economy delivery options are availabe. You can choose an approximate preferred delivery date at the checkout. Perishable food can only be delivered within the European Union. Outside of the EU any selected perishable items will be substituted for other items to the same value or higher. Unfortunately, currently we CANNOT SEND HAGGIS TO THE USA, CANADA, NZ or OZ, sorry. USA and Australia restrict the import of meat products, these will be substituted if necessary. International delivery prices depend on weight, volume and destination and will be calculated at the checkout. Express and economy international delivery options are available. Click here for a ROUGH GUIDE to international delivery prices. Delicious, seasonal offers and discounts, subscribe to our newsletter.